Has she ever tried to chase/kill your chickens? 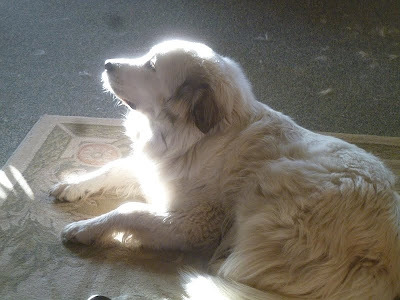 We had a dog for a time (only HALF Great Pyrenees), but we could not keep her from frolicking around the birds and occasionally killing them (never eating them). She would probably chase chickens if she weren't confined to the yard. When she's out of the yard, she's on a leash. My understanding is Pyrenees can either be livestock guard dogs protecting a flock or herd, or they can be house dogs -- but not both. In our case, she's a house dog -- you might say WE are her flock, because if one of us goes away she's very distressed (it's quite cute, actually). She's very protective and defensive of us, which after all is her purpose in life. what kind of camera do you use for your pics? Erika, I use a pocket-sized Panasonic Lumix DMC-FH20. Since I carry it around with me almost all the time (usually shoved in my pocket), it seems to have developed some spots on the inside lens (where I can't clean it), resulting in unfortunately black spots on the photos. Oh well, I never claimed to be an expert photographer. Rather, I just use the photos to illustrate the blog and document our life. Lydia fix! Wonderful pictures, as always. Must hide this from the kids. They're still obsessed and bent on acquiring their own giant fuzzy. And my will is eroding every time you post these pictures!